Mercedes-Benz has launched ViaVan, a ridesharing service, in London. 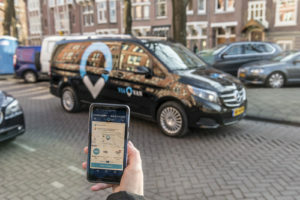 A joint venture between Mercedes-Benz Vans and US-based start-up Via, the ViaVan service will operate in TfL Zones one and two initially. Successfully launched in Amsterdam in March, London is the second metropolis in Europe where the new company is operating the service. Other cities, including Berlin, will follow as soon as the required permits are obtained. The principle behind ViaVan is combining travel requests with the same or similar goals in real time. The passengers are guided by the app to a nearby virtual stop, where they are then picked up by a professional driver. The algorithm behind the system ensures that the rides are only minimally delayed despite the intermediate stops and that hardly any detours arise through intelligent route planning. The bundling of rides will sustainably relieve traffic in the city and at the same time increase mobility capacity. The new mobility company also aims to offer attractive conditions for drivers, including a desirable compensation system and high flexibility in shift choice and length. In addition, the company ensures that drivers never exceed the maximum shift duration of ten hours. Passengers can contact ViaVan at any time for problems or questions with 24 hours a day, 7 days a week support.